See also: Capitals, Colonial and State; Joel Lane House; Meredith College; North Carolina Museum of History; North Carolina Museum of Art; North Carolina State University; Shaw University; State Capitol. Raleigh, the capital city of North Carolina, named for Roanoke voyages sponsor Sir Walter Raleigh, was created by an act of the legislature in 1792. Joel Lane sold the state 1,000 acres in the vicinity of Wake Court House on which to build a town. Raleigh was planned by state senator William Christmas of Franklin County. The original plan consisted of 400 acres and included five public squares. The largest lot, known as Union Square and located in the center of the plan, was designated as the site of the statehouse. Another of the squares was suggested as the location of a governor's residence, although it would be another 100 years before one was actually built there. Raleigh grew very slowly and experienced several devastating fires in the early nineteenth century. The arrival of the railroad in 1840 spurred some development, and the city limits were expanded for the first time in 1857. A new capitol building to replace the statehouse that had burned in an 1831 fire opened the same year the railroad was completed. The Civil War brought an end to Raleigh's midcentury economic boom. In April 1865 the city was occupied by Union forces after surrendering peacefully, avoiding the destruction suffered by many other southern cities. Like the rest of the postwar South, however, Raleigh-and all of North Carolina-struggled to overcome the economic devastation of the war. Important in the city's later development were several colleges established in the second half of the nineteenth century, including Shaw University (1865), Meredith College (1891), and modern-day North Carolina State University (1887). A new governor's residence was completed in downtown Raleigh in 1891. A second expansion of the Raleigh city limits came in 1907. A number of suburbs, reached by trolley lines, sprang up outside of the original boundaries. The city experienced significant growth during the First and Second World Wars, and in the second half of the twentieth century, the expansion of state government and the development of the Research Triangle Park brought an influx of people and businesses to the area. Cary, directly adjacent to Raleigh, became one of North Carolina's most populous cities. Many new state buildings were constructed, including a new Legislative Building completed in 1963. Raleigh has numerous cultural attractions, partly by virtue of being the seat of state government. The publicly funded North Carolina Museum of Art, North Carolina Museum of History, and North Carolina Museum of Natural Sciences are flagships in the state's historical, cultural, and educational offerings. The State Fair is held in Raleigh each October. The city's Progress Energy Center for the Performing Arts features Raleigh Memorial Auditorium, the Fletcher Opera Theater, the Kennedy Theatre, and the Meymandi Concert Hall, the latter serving as home to the North Carolina Symphony. In addition to hosting major college sporting events and touring shows, Raleigh's RBC Center is home to the Carolina Hurricanes of the National Hockey League. 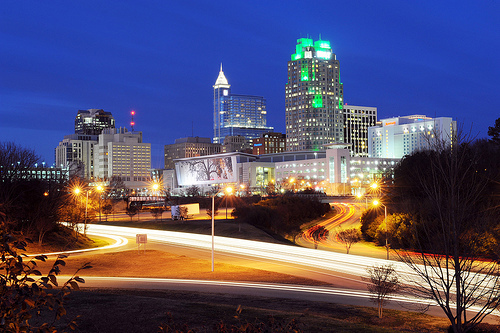 Raleigh's population was more than 325,000 in 2005, making it North Carolina's third-largest city. Candy Lee Metz Beal, Raleigh: The First 200 Years (1992). 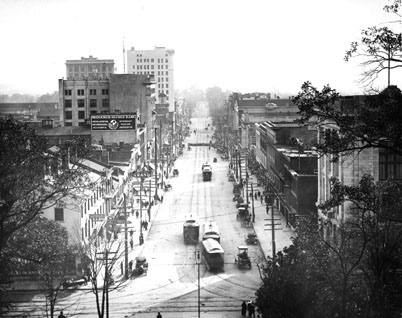 "Elevated view of Fayetteville Street, Raleigh, NC, looking south showing the main business district, 1913." From Carolina Power and Light (CP&L) Photograph Collection (Ph.C.68), North Carolina State Archives; call #: PhC68_1_90. Available from http://www.flickr.com/photos/north-carolina-state-archives/2340423433/ (accessed December 4, 2012). "Downtown Raleigh at night - January 2012." Raleigh, North Carolina, US, December 29, 2011. Available from: Flickr Commons NCDOT, http://www.flickr.com/photos/ncdot/6680749589/ (accessed December 4, 2012).